"I am not an animal! Hear me? I'm not an animal. Well... okay, maybe I am kind of an animal, I'm a duck. And I don't wear pants. But I talk and live in a house, so you know what I had in mind." They're animals who think, talk and act mostly like human beings. Unlike the Speech-Impaired Animal or Talking Animal (whose priorities and motivations are still that of an animal despite their ability to speak), the Funny Animal has almost all the mannerisms of a human being. Sometimes, only his appearance distinguishes him from the hairless primates who draw him. Indeed, one of the main incentives in using such characters are that they are more distinctive, and hence easier to draw as recognizable individuals, than ordinary humans. Or maybe it's just because Furries Are Easier to Draw. The main distinguishing trait of many Funny Animals is that in most situations, they can be replaced by a human and the plot would be mostly identical. Unlike Petting Zoo People, which have animal heads and tails on humanoid bodies, Funny Animals have a body that is generally shaped like that of their respective species. Funny Animals are bipedal even if their species is not naturally so, and most Funny Animal birds have Feather Fingers, whether their wings look completely like wings or look (to varying degrees) like arms. Some Funny Animals can shift between using two legs and four. Practically any cartoon series from the Golden Age of Animation, or video games aimed at children younger than 13 have at least one such character. Funny Animal is the technical term used by cartoonists to refer to the genre and characters. Also note that the "funny" in the title isn't literal. Frequently overlaps with Animal Superheroes and Intelligent Gerbil. May live in a World of Funny Animals. May suffer from Carnivore Confusion and Furry Confusion. See Petting Zoo People for characters who are even more anthropomorphized, and Civilized Animal and Talking Animal for those who are less anthropomorphized. For further tropes pertaining to funny animals, furries and the tropes that appear frequently in their genres, see Funny Animal Tropes. Compare Intellectual Animal. Closely related to Beast Fable, which is the ancient form of the genre. On the Sliding Scale of Anthropomorphism, these fall somewhere between the Civilized Animal (who still looks and acts like an animal, but lives in a Mouse World of some sort) and the Petting Zoo Person (who might as well be human). Alexandr and Sergei from Compare the Meerkat. The title character from Black Cat Detective. If Samuel L. Jackson were a cat, then he would also apparently be a Chinese police officer. Tama from Hayate the Combat Butler. He speaks perfect Japanese, can walk on two legs, has a degree in economics and is a qualified boiler room operator. Hayate is the only person who knows he can do it, however; to the rest of the cast he is just a lovable, oafish and above-average intelligent tiger (or 'big cat'). He's also spoken in front of Wataru. When confronted about speaking in front of others he says something about not wanting to shatter the girls' (Maria and Nagi) dreams. In Studio Ghibli's Porco Rosso (The Crimson Pig) the main protagonist is a pig, or more exactly a "pig-headed" human as he has the complete anatomy of a stout person except for the head. He is the only one of his type and lives among a human society who, while aware of his difference, don't find it bizarre and sometimes openly point it out. It's stated that he somehow became a victim of a Baleful Polymorph, given that there are pictures (and a flashback) showing him in human form. Meowth of the Team Rocket trio taught himself "human talk" and how to stand on his hind legs, all for the love of a female Meowth named Meowzie who said that a human could do more for her than anything he could (as in, the food, housing and adoration), only to be rejected as now she considers him a freak. In one manga adaptation, a story arc centers around the kitten of the very same Meowzie; she's found in a Poké Ball the gang purchases (unable to get captured herself, the mother pops her kitten into an unsold ball to ensure that whoever finds her will give her a good home). When Team Rocket, and thus Meowth, come around making trouble, Meowth meets this kitten and instantly sees her mother in her face and shining coin. Then she tells him it's creepy how he acts like he's a human. Oh heartbreak. Mewtwo seems quite human-like, but his psychic powers make that easy. In Pokémon Special, he actually has Blaine's DNA and is thus a Half-Human Hybrid. 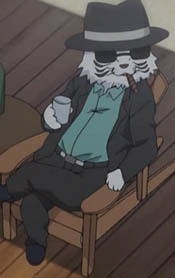 Chamo in Mahou Sensei Negima, an ermine with a suspicious attraction for human girls. Most definitely a human mage that was slapped with the Academy's very specific punishment for breaking The Masquerade. The punishment is explained by Negi himself. There's a couple examples in Dragon Ball Z, which stick out like sore thumbs among the overwhelmingly human/space alien cast. Puar probably also counts. Tthey only stick out if you never saw or read the original Dragon Ball, which was a much more light-hearted series and almost overflowing with Funny Animals as secondary and tertiary characters. Dragon Ball was originally based on Journey to the West, which had Zhu Bajie (known as "Cho Hakkai" in Japan and "Pig" or "Pigsy" in most English translations) and Sun Wukong (better known by his Japanese name "Son Goku") as two of the main characters-Oolong and Goku, only in their original forms. Damekko Doubutsu takes this to it's logical extreme. The characters look like humans in costumes. It never actually comes up in the series. Fairy Tail's Happy and Charle, the flying cat companions of Natsu Dragoneel and Wendy Marvell, respectively. Happy even becomes offended at one point when an enemy doesn't count him as being a mage. Tony Tony Chopper, a gullible reindeer doctor. Justified Trope in that he ate the Hito-hito no mi (Human-human fruit), which gave him human intelligence; before that, he was an ordinary (albeit blue-nosed) reindeer. Bepo, an apologetic, self-conscious polar bear. Whenever he's aware of people who are surprised at the fact that he can speak, he'll get depressed, hold his head down in shame, and apologize to them. When Pappagu the starfish was young, he mixed up the word hitode (the Japanese word for "starfish") with hito (a Japanese word for "human"), so he thought he was human. By the time he realized he was a starfish, he had already learned how to speak like a human. He has also created the successful "Criminal" clothing line. Pekoms, one of Big Mam's subordinates is a lion, with little eyes (which he counsel behind sunglasses) a formal attire and excellent fighting skills. "Dogs Playing Poker"; a series of paintings by C.M. Coolidge, refers to a series of paintings where the dogs not only play poker (in various locations, with varying degrees of honesty) but playing billiards, watching baseball, testifying in court, fixing a car, and so on. DC Comics' Captain Carrot and His Amazing Zoo Crew, which contained several Continuity Nods to the other Funny Animal comics DC published. In Amulet, the population of Kanalis. Unusually, it's due to a curse, and we actually see people in the process of turning into them. Tawky Tawny is a very civilized version of this in the original Captain Marvel. The titular duo of Sam and Max Freelance Police, with Sam leaning slightly further towards being a Petting Zoo Person than Max but still having enough animal coding to be this trope. Some characters, like Sal from the video games, also qualify. Carson the Muskrat from Dork Tower. He doesn't wear clothes, but otherwise uses computers, gets jobs, drives cars, and functions socially like everyone else. Very common in British Comics examples include Biffo the Bear and Big Eggo from The Beano, Korky the Cat from The Dandy, Mickey the Monkey from The Topper and Rupert Bear. The works of Richard Scarry, particularly the Busytown books. All of the non-human sentient creatures in the world of Alan Dean Foster's Spellsinger novels. All the characters in the Geronimo Stilton series. Wicked makes an important distinction between animals, who are your average unintelligent beings, and Animals, who are this. Black Dogs has Funny Dogs, Ferrets, Wolverines, Badgers, Polar Bears, Hyenas, Giant Ground Sloths, and it is implied that humans are just another breed of Funny Animal that resemble monkeys. The animals from Animal Farm especially the pigs. Adventures in Wonderland 's White Rabbit counted as this. Oddly enough, the March Hare in the same show was more like a Petting Zoo Person. Snoopy from Peanuts is an odd corner case, in that he lives in a dog house and doesn't speak, but still manages to be very expressive, and largely acts human, with some members of the cast occasionally forgetting that he's a dog. Otto, Sarge's dog in Beetle Bailey, is another example of a non-talking Funny Animal. When first introduced in the strip he was more of a regular dog, but over time Mort Walker began having him walk upright, don a full uniform, etc. The Far Side has funny animals of all kinds, from cows to insects to amoebas (the Rule of Funny superseding the fact that protozoans are not animals). Hobbes from Calvin and Hobbes. Hobbes is really a mix of Funny Animal and Talking Animal; he walks on two legs and sleds, plays baseball, and talks with Calvin sometimes and walks on four legs, pounces, ands runs around friskily other times. The main characters of Pearls Before Swine are all Funny Animals who live in a Crapsack World. Fabuland, a LEGO theme from the 80s. Beyond Good and Evil has these for most of the NPC's: Pig-men, shark-men, walrus-men, etc. Taking pictures of them with the camera names their species in the form of "[Species] Sapien." Bug!. Most of the arthropod enemies in the game aren't, though. Inherit the Earth: Everyone is one of these, due to Executive Meddling. Lugaru. And its upcoming sequel Overgrowth is a somewhat more realistic take on this trope. RHDE. The Volci are bipedal canines. Tail Concerto and Solatorobo are set in a world of floating continents in the sky, populated by dog-people and cat-people. While they mostly act like humans, the dogs are prone to chewing on bones and their national pastime seems to be frisbee-cathing. Toontown Online is based around them. Urban Rivals. All of the Jungo clan falls under this. George the Dragon is a Funny Animal, surrounded by Funny Animals. The Furry Comic genre is filled with Funny Animals, Talking Animals, and Petting Zoo People. Horndog: Creator Isaac M. Baranoff specifically states that Horndog and Here Wolf are "Funny Aminal" comics. Bun-Bun and Percy the Wooly Mammoth from Sluggy Freelance are half-way between this and Talking Animals. Percy even had his own psychiatric business. In the No Rest for The Wicked, Perrault is a Funny Animal—as opposed to the Talking Animal from the source Fairy Tale, Puss in Boots. The KAMics Mr. & Mrs. Rockhound cartoons have anthropomorphic dogs in place of humans. In Everyday Heroes, Summer's classmate is has a cow-like head and tail. She and her father are actually from another planet, yet no one comments on their appearance. Word of God has it that other alien races fall under this trope (for example, the "Dogs Of War"). In Harkovastevery character is a talking animal person, with each nation being made up of a particular animal. The only possible exception is the Nameless, whose species is indeterminate at the moment due to their all covering armour and helmets. VG Cats: main heroes (and their family). Loserz is no furry comic, but occasionally Max and Cecil have an appearance. Precocious is another funny animal comic. Tiny Kitten Teeth- There are animals that actually exist as animals, alongside funny animals, usually no distinction between species aside from stature. Don't try to make logic of it. The entire cast of Ozy and Millie. All of the pets in Virtual Pet Planet. The Demonic Duck from El Goonish Shive. Cucumber Quest. They're all humans with rabbit ears (or cat ears). The Skrii'qek of Nahast: Lands of Strife are a race of Big Badass Birds of Prey who talk and act like humans. Everyone in The Packrat except for the YouTube "celebrities" in the November 2010 strip. The furry characters in Darwin's Soldiers. In The Impossible Man, Dom Coqui is a four foot tall talking frog. In the Paradise setting, humans are randomly, permanently transformed into Funny Animals (and occasionally gender-changed) by causes unknown. A Weirdness Censor renders these changes Invisible to Normals, who continue to see the Changed as their original human selves (and genders), leading to a Masquerade on the part of the Changed in order to keep from being committed to mental institutions or worse. Eventually the Weirdness Censor comes down, leading to The Unmasqued World. "Funny" may be a bit of a misnomer for Ruby Quest and Nan Quest, but they do feature animals who for all intents and purposes act as humans. The sentient chimpanzees, orangutans, and gorillas from the Global Guardians PBEM Universe. Also the super-heroine Black Betty, a gene-altered humanoid skunk who highly resembles a female Pepe LePew. Chicken and Moose are these, though they also appear to be made of metal. The Onion published an excellent article based on this trope in the editorial section, titled "Stop Anthropomorphizing Me", written by Gerald the Dog. The "core" stars of the Classic Disney Shorts - Mickey Mouse, Donald Duck, Goofy, and so on. DUCKULA: You mean human sacrifice? YUBI: Well, almost human sacrifice, give or take a feather. The cast of Tale Spin. Baloo started as a Talking Animal living in the jungles of India and wound up an Anthro flying a plane and living in a city. Courage the Cowardly Dog. While everyone acknowledges that Courage is a dog and usually treat him as such, other Funny Animal characters get by with no reference at all to their species. Courage's own characterization as a dog slips sometimes. Often the alien/evil entity/villain of the day (who is sometimes also a talking animal) will treat Courage on the same level as the humans. Often by trying to kill them. The penguins in Happy Feet are an odd case; at times they uncomfortably straddle the line between penguins who can talk and penguin-people. Brian Griffin of Family Guy usually falls squarely into this category, albeit with occasional Talking Animal moments (particularly in the first run of the series, where they were more frequent). The chickens in Chicken Run are difficult to categorise—the humans treat them just like any other chickens, but most of them wear at least one article of clothing and the stupidest one is capable of knitting. All of the cast of Wow! Wow! Wubbzy! All members of the London Clan in Gargoyles resemble humanoid animals with feathered wings. The Mutates are a genetically-engineered, chimeric version. I Am Not an Animal. The animals were genetically engineered to talk and were raised with celebrity magazines photoshopped so half the people had animal heads. They escaped and didn't realise that animals aren't supposed to talk. The Schnookums and Meat Funny Cartoon Show: Schnookums and Meat themselves, plus many of the characters on the Pith Possum segments. Chu-Chu from The Amazing Chan and The Chan Clan is responsible for a lot of the show's funniest moments. Mordecai: Dude, don't dig in the trash. It's not natural. The entire cast of The Great Mouse Detective could be replaced by humans and it wouldn't make any difference at all. Well, except for Toby who is very much a dog. A few of these show up as background characters on Jimmy Two-Shoes. When you consider how other citizens look, it's no surprise they don't stand out. Klaus on American Dad. Justified by the fact that he used to be human, but had his mind inserted into the body of a goldfish. One-off antagonist Zeb (A zebra) from the original My Little Pony cartoon. Rather jarring given that most of the cast are also equines, but are not anthropomorphized to the extent Zeb is. Every character in Alfred J Kwak, barring a rather beastlike human. Strangely Popeye the Sailor encountered one of these in "The Hungry Goat". The short overall felt like more of a Tex Avery cartoon than a Popeye cartoon. Funny animals are featured prominently in "Popeye The Sailor" and "I Eats My Spinach". Justified, as Fleischer Studios was known to use these in the Betty Boop cartoons, where the Popeye series branched out of. Older Than Dirt: The Ancient Egyptians apparently liked funny animals. The story of The Mouse As Vizier features talking animals who have a very human political system, and several papyri depict animals such as mice, cats, hyenas, antelope, crocodiles, donkeys, monkeys, and lions playing board games, using weapons, drinking out of goblets, and playing musical instruments. Except for standing on their hind legs, they aren't anthropomorphic at all. And they completely ignore natural predator-prey relationships. They even herd livestock and ride chariots pulled by normal animals. A fancy Sumerian lyre, dated to c. 2600 BCE, features inlay scenes that depict funny animals. A bear, jackal, and donkey play music, while a lion and an antelope serve beverages. Except for standing on their hind legs and having hands, they look like normal animals.